Doctor of music, Tuomas Pyrhönen is nowadays among the most active Finnish concert organists. He studied at the Sibelius-Academy in Helsinki obtaining his bachelor of music exam in 1994 and organ diploma in 1996, studying organ as professor Kari Jussila's student. Immediately after that he studied at the Stuttgart Music University with professor Ludger Lohmann achieving his "Final artistic exam" there in summer 1998. Mr Pyrhönen has supplemented his studies in Finland, the Netherlands, Italy and Great Britain. He studied privately organ improvisation with Anders Bondeman in Stockholm. Pyrhönen played his premiere concert at the Kallio church in Helsinki in December 1998. As organist he has performed in Hungary, Estonia, Lithuania, Latvia, Russia, Switzerland, Denmark, Italy, Norway, Iceland, Armenia, Ukraine, Slovakia, Croatia, New Zealand, Poland, Ireland, France, Sweden, Germany and United States. Tuomas Pyrhönen likes contemporary music very much. He has also transcribed piano and orchestral works for organ. Moreover he regularly performs basic repertoire and seldom heard organ music and also improvises with pleasure as well. Pyrhönen has recorded four cd's. Tuomas Pyrhönen has worked in Joensuu parish as church musician since February, 2002. He has also worked as organ teacher and music critic. 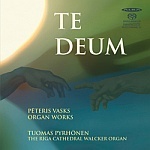 Beginning autumn 2010 Pyrhönen started his doctoral studies Finnish contemporary organ music as his subject at the Sibelius Academy, Helsinki. He graduated there in November, 2015.